You can also read about mythology to get better acquainted with the Moon. The Greeks named her Artemis, shown left here with the deer. She was also known as Diana. Greek mythology is a lot of fun to learn. Another book to read is Carl Jung's Man and his Symbols. He writes, “And though modern space flight has proved that the moon is only a cratered ball of dirt, we have retained something of the archetypal attitude in our familiar association of the moon with love and romance." There isn't much more about the moon in this book, but it will help you to understand the moon better by relating to all of the symbolism Jung chose to detail about what he calls the unconscious. “What we call the psyche is by no means identical with our consciousness and its contents...” Most people relate to the stories about how the Moon affects the deepest emotions, that it is feminine. She is the Sun's night candle. 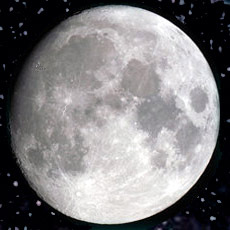 In its 29.5-day cycle, the Moon moves through one sign in 2.5 days, which is 12 to 14 degrees per day. It moves 33 minutes per hour, which is approximately .5 degrees every hour. So, the moon moves about 1 degree every 2 hours. There are 60 minutes to 1 degree, to make this simple. Think about this when you watch the ebb and flow of the tides, which change every 6 hours just from the gravitational pull of the Moon! And imagine that while you are standing there watching the ebb and flow, the Moon is moving through space with the same speed as its own diameter—2,287 miles per hour! Wait three days after a New Moon to take action on any project or something you consider very important. On the fourth and fifth days, get serious about any new beginnings. Sidereal: Time it takes the moon to be conjunct a star in the sky (same spot every month—27.3 days); Synodic month: Normal lunar month, 28-28.5 days with Sun; 29.5306 lunar month (new moon to new moon). There are 13 lunar months. All lunar calendars are based on the Synodic month. By pinpointing the degree of the New Moon in your horoscope every month, an astrologer can tell you where the energies are strongest for you and what action to take in your life for the next month (and into the future by knowing where the New Moon will fall for the next year). New Beginnings...it's like starting over every month. You are given a chance to create a positive direction by the actions you take. Other sources: The Lunation Cycle descriptive adjectives: Astrology For Yourself by Douglas Bloch and Demetra George (1987); Web sites provided in Part 3; quotes from a brilliant astrology teacher, Jeffrey Brock (JB).